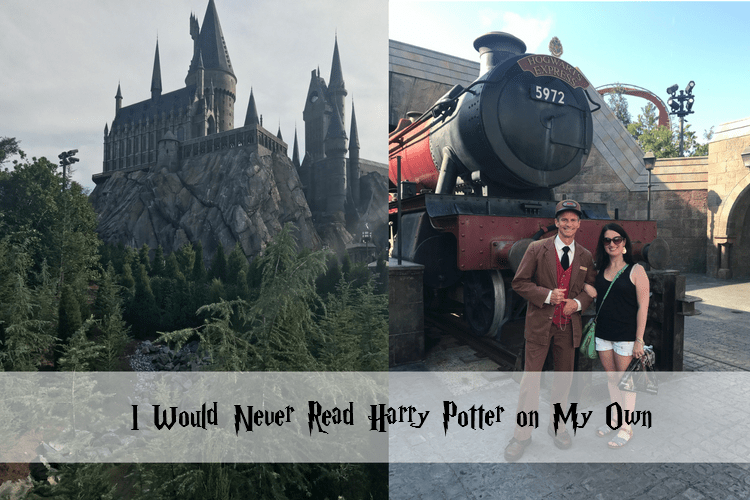 Last month I had the chance to visit the Wizarding World of Harry Potter at Universal Orlando with a friend. Instead I choose to spend a few extra hours by the pool with a cocktail. The last thing I wanted to do after 3 kid free days was go into a theme park. Especially after a conference. Conferences can be exhausting and my introverted self just wanted quiet, something that would not be found at the Wizard World of Harry Potter. So I almost didn’t go. But then at the last minute the little wanna be extrovert that lives in my head shouted that I should go, because I should do more than stay at the hotel and it would look great on Instagram (sorry but that’s how bloggers think). I hopped in a Lyft and as my driver missed the exit for Universal I debated telling him to take me back to the hotel. I arrived at Universal Orlando and met up with Shell who knows everything about Harry Potter. I love Shell’s enthusiasm for all things Harry Potter. But as she led me to Hogsmeade (and to clarify I just texted her to ask her where in Harry Potter World we were), all I felt was completely out of place. Like I was in the wrong story. Like I woke up in a strange land filled with people who all knew the words to a song and I was singing something different. I had a butterbeer, because I had been told when in the Wizarding World of Harry Potter, that’s what you do. I took a picture by a train, because it’s what you do and I brought a chocolate wand from people in silly costumes and I took some pictures of a fancy castle. Truth, I didn’t know that castle was Hogwarts. Then I went home, more confused than I was before. I had never read Harry Potter and I never had the desire to. I tried reading it when I was 21 and working in a book store, but at the same time chick litt was big and so was going to the bar till 3 am. A 12 year old boy wizard just wasn’t interesting to me. I never gave Harry much thought after that. 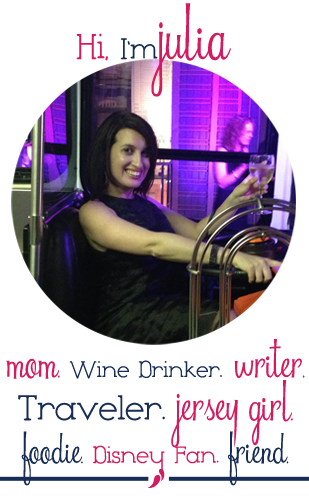 I didn’t have to, my husband wasn’t into it and my son was too young for it, besides I had Katniss and Bella, I didn’t need Harry. But after being in Hogsmeade I felt a little left out. Like I needed to immediately know what all the fuss was about. 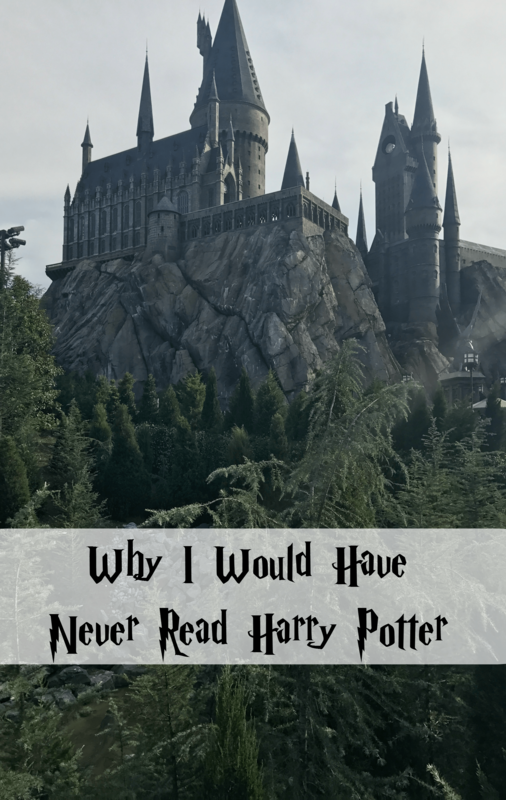 I suffer from FOMO and Hogsmeade made me feel like I was missing out. I decided I wanted to watch the movie, but I’m a big believer in reading the book first. But I really wanted to know what I was missing. I wanted all the little inside jokes to click. I wanted to take the easy way. I wanted to know what a muggle was and why I felt like one. So I posted something controversial on Facebook, I asked, if I could watch the movie before reading the books. You would have thought I had decided to talk politics, there were a variety of opinions. People feared that I would make the decision to watch without reading. Others didn’t think it was a big deal. It was a divided nation that day. I ended up buying the illustrated version of Harry Potter and the Sorcerer’s Stone , for Jack and I to read together. We started it last week and I can’t wait to find out what all this Harry Potter fuss is about.